If you're looking for something unique and stylish then you are at the right place at BB Crafts where you can definitely like our reversible jumbo dot grosgrain ribbon. These ribbons are available in a countless of colors such as hot pink, light pink, white, royal navy, orange ball, and a host of other special colors, patterns and textures at nominal price that suits your requirement. These grosgrain ribbons are also available with jumbo polka dots that can be used for scrapbooking, hair bows and gift wrappers. They're essential to make the gift look attractive and make that gift opening an exciting task. Grosgrain ribbon may be used to tie onto the flowers, balloons, or to enrich the patterns. 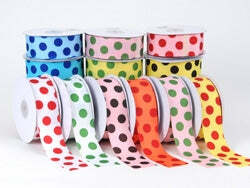 Jumbo dot printed Grosgrain ribbons are made from silk, nylon or synthetic products. Grosgrain ribbon dots can appear shiny or dull and either single color, or striped. BBCrafts.com is the perfect online place to find all these variety of Grosgrain ribbon jumbo dots which are expertly woven and cut and can be used for many creative assignments.